This is a building which wouldn’t look out of place in Cold War East Berlin or North Korea’s capital Pyongyang, with its drab, imposing facade. The jarringly cheerful murals at ground level are an attempt to lessen the effect of its brutal glory. But this isn’t a memento from a Soviet bloc town. This is in Shepherds Bush, west London and stands a short walk from where I live. The building bristles with the cables, circuits and communications equipment which helps the area’s telephone network stay in good shape. You could be forgiven for thinking it was a secret service facility, spying on the activities of the West. Maybe I should have captured it in authentic style with my Soviet film camera. But on one side of this colossus, the style harks back to another era. 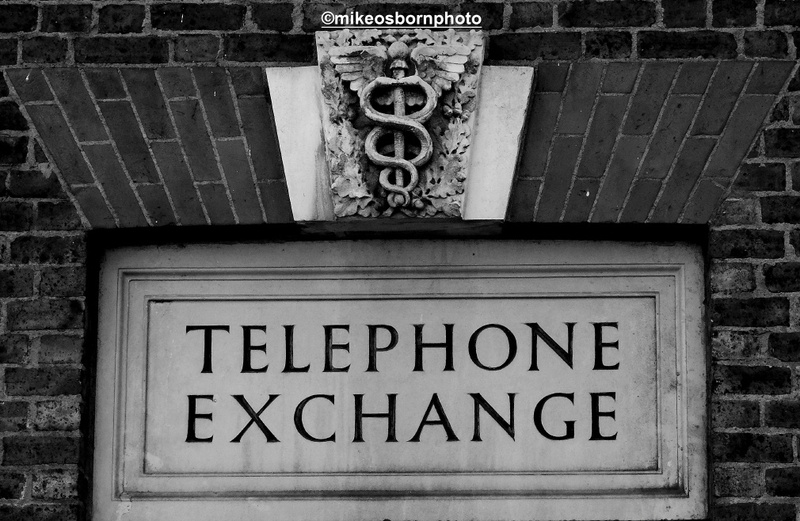 The sign gives the building away, and there is even a telephone box – a rare and fascinating sight in the age of the mobile. Goodbye Scotland Yard, Hello KGB! Hahahaha! Very good :) I was thinking more Stasi or Securitate. There should be some socialist slogans on those lurid murals! Thanks Richard. I imagine the place to be stuffed full of secret Stasi files! I think I have a bit of a love/hate relationship with those old concrete buildings. They are in one way very ugly and they are now so unattractive. And yet photographically the stained concrete sometimes has considerable photographic potential. Absolutely, Andy. But therein lies their appeal – so drab and austere. I never tire of seeking out these buildings of which there are many. I bet knowing the “GPO” this telephone exchange is empty. Great set of images Mike, reminds me of my time living in East Berlin just after the wall came down. Thanks James, glad they evoked those memories. It’s a very stark building. However, it’s still functioning and packed with wires and circuits. I think I rely on the place for my Broadband signal! Whoops! Trust me to put my big foot…… Hope the broadband is still working considering all the old wiresband circuits. Have a great evening. Hahahaha! Yes, it’s all good. Just walked past and there are a couple of lights burning. Much spookier in the dark. It may be, as you say, a drab, Soviet looking building …. but, your photographs have given some beauty to the building. Very nice! Hi John, thank you very much! It’s a very austere beauty which deserves to be captured.